Take into account geographical, economic, and demographic differences when formulating water policies. This report focuses on the destabilising potential of water scarcity and examines how failure to implement effective policies exacerbates the risk of conflict, with illuminating case studies revealing current trends and different ways in which water can be a source of conflict. The Middle East and North Africa is the most water-scarce region in the world. Nearly two-thirds of the population there are living in areas that lack sufficient renewable water resources to sustain current levels of activity and growth. Weather patterns are becoming increasingly erratic, populations are growing, and transboundary tensions have recently abounded. When combined with these factors, constrained access to water is set to lead to greater instability in the region. This is likely to take the form of: increased population movements within, across, and out of the region, including towards Europe; domestic social unrest; conflict between neighbouring countries; and an even more degraded natural environment. It is not just a question of geography; it is a question of governance and politics too. Few governments in the region have put in place and implemented sound plans to mitigate the worsening impact of this water scarcity. Most actually continue to incentivise high levels of water usage through low water pricing. While some countries have taken positive steps towards addressing aspects of this problem, too many remain prone to adopting quick fixes. There is nothing inevitable about this situation. To resolve it, states in the MENA region must pursue an integrated and holistic approach to managing both water demand and supply; they must create contingency plans that can meet future challenges. The story will not be the same for every country: the region is diverse and each government will have to find its own way forward. In doing so they will need to take into account geographical, economic, and demographic differences when formulating water policies. Through forward-looking policy and strategic planning, water-scarce regions can guarantee a level of security that rivals that of water-rich states. Non-conventional sources of water supply, such as desalination plants, can mitigate the detrimental impact of scarcity, as can managing domestic levels of water consumption by ensuring that price reflects cost. And some MENA countries can already point to successful initiatives aimed at addressing water scarcity. But, overall, the region is in a precarious state when it comes to water. The challenge will be for all countries to learn from best practice and good governance about securing their water supply. Rather than explore strategies to enhance water security – such studies exist in abundance – this report focuses on the destabilising potential of water scarcity. It examines how failure to implement effective policies exacerbates the risk of conflict. This is particularly important considering how rapidly water scarcity and other forms of environmental stress are beginning to shape regional developments. Although resource scarcity and climate patterns are rarely – yet – the principal drivers of conflict, environmental factors have already acted as multipliers on numerous occasions. In such instances, they have aggravated political, economic, and social causes of instability within and between states. The case studies in this paper illuminate current trends and reveal the different ways in which water can be a source of conflict. Water-scarce regions are those in which there are few renewable sources of water available. But such regions can still invest in securing non-renewable sources of supply, and therefore meet their consumption needs. A place that is water-scarce can still be water-secure. Water insecurity, on the other hand, means that levels of consumption exceed levels of available water, renewable or otherwise. A water-rich country that uses water haphazardly can be insecure. So, being water-scarce, as many countries in the MENA region are, does not make water insecurity inevitable. A recent World Bank study warned that governments in the MENA region are struggling to address the nature of their countries as water-scarce, or achieve the security needed for sustainable water usage. This is not a new diagnosis: in 2011, the Arab Ministerial Council issued its Water Security Strategy, a document that demonstrated the scale of the challenge and outlined a region-wide joint framework to address water scarcity. Truly addressing this challenge would entail tackling issues of consumption and supply to achieve a greater level of water security, or sustainable levels of water usage, despite resource scarcity. But the situation today shows that governments are yet to properly confront the challenges of water scarcity. Two-thirds of the population in the MENA region live in areas with insufficient renewable water resources to sustain current levels of consumption – this compares dangerously unfavourably to the global average of 35 percent. This is not a standalone problem: regional trends mean that the potential for water scarcity to play a role in causing conflict is increasing. One of the most crucial transformations is a rapid growth in the population and its growing concentration in urban areas. At around 2 percent a year, population growth in MENA countries is steep compared to that in other parts of the world. A ‘youth bulge’ has already proved a challenge to governments, primarily on the social and economic fronts, as seen in the Arab uprisings and their consequences. By 2050, close to 400 million people living in the MENA region will be city-dwellers. Rising urban population density causes particular stress on water resources. Within cities, the demand on water infrastructure is likely to further erode quality of life, thereby adding to the list of grievances that people have towards ruling elites. This may cause the younger generation to increasingly call for better governance and higher socioeconomic standards. In addition, urbanisation may exacerbate rural-urban divides if governments then come to focus their services on cities that have high population densities and that the political and economic elite reside in. The growing gap between poor water access in rural areas and better access in urban areas creates the sense that states are corrupt and focused on self-serving interests. Government attempts to enhance water security, through efforts such as subsidy removal to dampen demand, or investment in desalination plants, can actually exacerbate such suspicions. Without a targeted approach, such interventions often end up disproportionately harming the disenfranchised poor and benefiting the political elite. This can in turn aggravate feelings of distrust and strain the relationship between governments and citizens. Furthermore, urbanisation inevitably alters the economic make-up of states, with implications for water security. While some countries are more industrialised than others, agriculture is generally a core contributor to the regional economy. 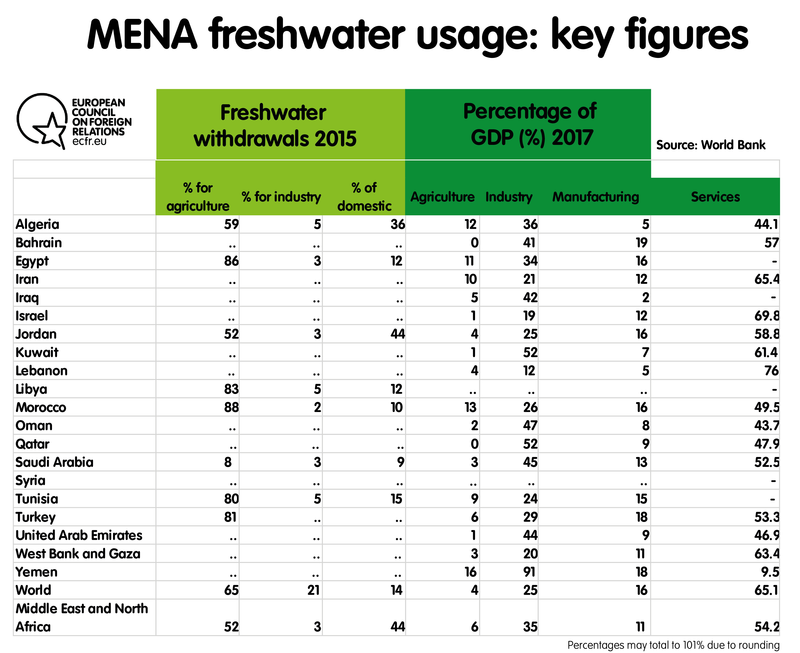 In the MENA region, as elsewhere in the world, agriculture tends to be the biggest consumer of freshwater resources. Water usage in agriculture across the region is suboptimal, as countries often grow water-intensive crops that reduce the productivity of limited water supplies. Irrigation, transportation, and distribution infrastructure also tends to be quite wasteful. Urbanisation reduces water withdrawal for agriculture, possibly redirecting it to other less water-intensive industries. But this comes at the expense of investing in a sustainable and productive agricultural sector that remains vital for regional economies and for supporting city populations. In addition, environmental issues overlay tensions around governance, demographics, and inequality. Increasingly erratic climate patterns driven primarily by climate change, from rising temperatures to unpredictable rainfall, have served to increase the tensions that problems with water can generate. Such environmental stress can either be a domestic issue, where states struggle in the face of climate shocks such as droughts, or a transboundary issue, where there is increasing competitiveness among states as they each pursue water security and claim expanding shares of ever-shrinking shared natural resources. The five case studies that follow capture the diversity of the water scarcity challenge in the MENA region. They reveal ways in which failures to properly respond to the demographic and economic trends sketched out above combine with particular domestic, transboundary, and environmental factors to cause instability, increasing the potential for conflict. They indicate how strategic planning and good governance are prerequisites for averting future problems. This report finds that European governments and the European Union have a significant role to play in helping MENA governments and societies to adapt to their own changing circumstances, through technical expertise, funding, and diplomatic and political support. Jordan is the fourth most water-scarce country in the world. One of its primary sources of water is the Jordan Basin, an aquifer that straddles Lebanon, Syria, Jordan, the West Bank, and Israel. The water originates in the north and flows down the River Jordan towards the Dead Sea. Over the past half-century, water availability has dropped precipitously due to upstream diversions, irresponsible waste discharge, and the cultivation of water-intensive crops in the Jordan Valley and elsewhere. Most Jordanians have access to basic drinking water services – 98.9 percent of the urban population and 96.9 percent of the rural population. Yet, while access is high, services remain unreliable. More importantly, faults in the distribution infrastructure (primarily, leaking pipes) and inefficient irrigation practices waste significant amounts of water. Erratic weather patterns, particularly in the form of unpredictable rainfall and periods of drought, along with excessive depletion of resources and a growing population have combined to make the situation more fragile. Specifically, these factors have heightened the threats inherent in water scarcity, expanding demand at a time when supply is becoming unreliable. Equally destabilising has been the increased demand for water generated by Palestinian, Iraqi, and Syrian refugees entering Jordan. The influx of refugees has further raised domestic demand, strained the government’s ability to provide water to refugee populations through effective infrastructure, and expanded competition over the scarce resources available to Jordanians. This has created significant strain and threatened to create a situation where water becomes a catalyst for social unrest. Consumption also remains expansive because, as with other countries in the region, the cost of Jordan’s water supply far exceeds the price that customers pay, a situation that incentivises irresponsible use. For a government that is heavily dependent on foreign aid, engages in unsustainable public expenditure, and possesses rapidly diminishing sources of renewable water, this situation contains imminent risk. Past attempts to reduce subsidies of various goods triggered large-scale protests and threatened the stability of the regime. Such unrest is driven by the fact that public trust in the ruling elite is low, given the presence of unchecked corruption and the belief that fiscal reform disproportionately benefits the rich. Jordan, Israel, and the Palestinians have a range of agreements in place that shape their cooperation around shared water resources. For Jordan, this comes from bilateral agreements signed with Israel following the peace treaty of 1994. For Israel and the Palestinians, cooperation was established through various agreements initiated after the signing of the Oslo Accords in 1993. 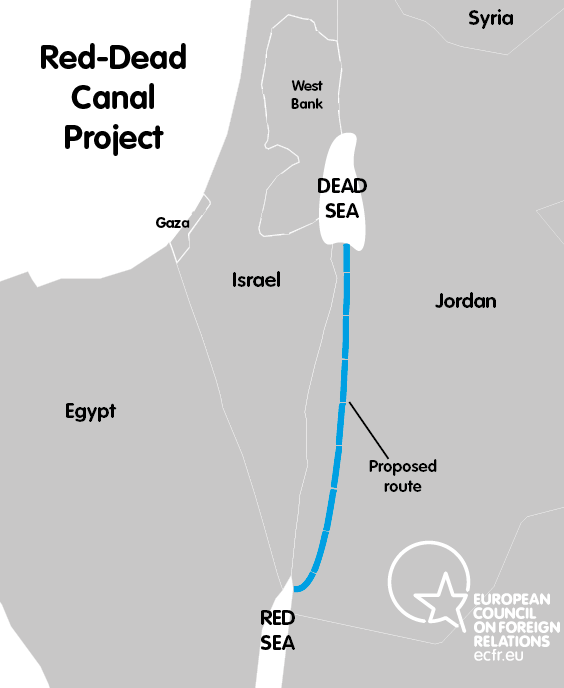 Furthermore, Jordan, Israel, and the Palestinians are now cooperating in the “Red-Dead Canal”, a large-scale project designed to transport water from the Red Sea into the Dead Sea. The project includes the construction of large desalination plants as well as hydrological power generators – potentially a “win-win-win” for Israelis, Jordanians, and Palestinians. This project has long been on the agenda; despite some recent optimism, scepticism continues to abound about its viability. Nonetheless, its backers hold the project up as one that could significantly enhance Jordan’s water security. Western governments and international organisations herald regional cooperation of this sort as a success – an example of how to avert conflict over shared resources and to promote peaceful relations. It is in this light that civil society organisations such as EcoPeace and international development organisations such as the World Bank actively promote bilateral and multilateral cooperation between Jordan, Israel, and the Palestinians. Yet such enthusiasm overlooks some of the more difficult obstacles to securing fruitful cooperation. The Jordanian-Israeli bilateral agreements are underpinned by a peace treaty that has safeguarded the rights of both countries and enabled an equitable use of water resources. Even with such a solid foundation, political tension repeatedly threatens this cooperation, as seen following the killing of two Jordanian guards at the Israeli embassy in Amman as well as the tensions following Donald Trump’s decision to move the United States embassy to Jerusalem. However, the absence of an equitable foundation between Israel and the Palestinians undermines cooperative efforts to address water insecurity or promote peace. The failed Israeli-Palestinian peace process has resulted in a situation where the share of water that Palestinians can access remains disproportionately lower than that for Jewish settlers living within the same territories. Given the stark power imbalance between Israel and the Palestinians, the cooperation that was outlined in the Oslo Accords and that continue to shape Palestinian access to water today has merely served to help subjugate the Palestinians and enable Israeli dominance. This is manifest in Palestinians’ complete reliance on Israel for their water supply. Palestinians are unable to access their water resources without having to go through Israeli channels and are not able to build and invest in water supply and distribution infrastructure without permits from Israel, which it often withholds. This is a reminder that the power of each negotiating party and the broader political reality informs the success and stability of treaties aimed at regional cooperation. In the case of Jordan, while the Red-Dead Canal would enhance water security, the Jordanian government and international funders must not treat this as a holy-grail project that would end all of Jordan’s water woes by itself. There remain many other steps they need to take. Domestic reforms aimed at curtailing demand as well as investments in alternative sources of supply are imperative. At present, reforms are the price Jordan has to pay for continued foreign aid: for example, the EU and European member states have identified reform of Jordan’s water management as a key priority. Unlike its Gulf counterparts, Jordan does not have the capital to rely primarily on non-conventional forms of water supply, such as desalination plants. This means that Jordan has not fallen into the trap of quick-fix solutions, and has been forced to begin considering more sustainable means of water preservation. These need to develop domestically alongside efforts by the government to pursue major infrastructure projects such as the Red-Dead Canal, which are funded by external development partners. The situation in Jordan reveals how countries that are water-scarce must pursue policies that aim to enhance both demand and supply in order to ensure sustainable water usage and achieve water security. Grand infrastructure projects alone are insufficient: domestic reforms, in the form of reduced subsidies, remain a priority. In the absence of a full suite of policies to deal with the issue, increased competition for scarce resources due to population growth or incoming refugees will turn water scarcity into a catalyst for domestic social unrest. Egypt’s water situation has begun to attract attention beyond the country’s borders, thanks to Ethiopia’s construction of the Great Ethiopian Renaissance Dam (GERD), a project that is still ongoing. Egypt has long relied on a 1929 treaty that determines its allocation of water from the River Nile; the country’s historical regional dominance had led it to secure a disproportionate share of the Nile. At present, Ethiopia’s decision to pursue the GERD for economic growth puts this treaty under pressure as it seeks to secure a greater share of water. If Ethiopia’s dam is filled to capacity, water flow to Egypt could drop by 25 percent in the coming seven years, threatening shortages on an unprecedented scale. Ethiopia began building the dam shortly after the 2011 revolution in Egypt, meaning that its northern neighbour failed to address this emerging threat. The Egyptian government also appeared confident that the water treaty would hold. This certainty has weakened of late, prompting the regime of Abdel Fattah el-Sisi to first countenance military action and then to concede that there was a need for renewed diplomacy. In 2015, Egypt, Ethiopia, and Sudan signed the Khartoum Declaration, which tried to tackle some of the implications of Ethiopia’s dam, including the “filling up” period. However, the agreement has yet to provide a multilateral framework for water sharing. As in the case of Jordan, Israel, and the Palestinians, diplomatic interventions that seek to address water issues contend with other economic, social, and political factors. Sustainable and equitable agreements require functioning states that are able to engage in the negotiations needed to achieve a true partnership. The Egyptian regime has a strong state apparatus and institutions, as well as centralised decision-making processes. Compared to Ethiopia and Sudan, Egypt is an economic heavyweight. Approaching negotiations in a manner that seeks to ensure a multilateral approach benefiting all countries, rather than one that seeks to sustain Egyptian dominance, might still allow Egypt to mitigate the detrimental impact of the GERD on its own water supply. The next step in Egypt’s diplomatic efforts should be to expand the 2015 tripartite agreement to allow the country to lead on a joint regional approach to manage climate change and water scarcity. That said, it is unclear whether Egypt will succeed on this front, not least because of the dominant role the military plays in these issues, a reality which might favour a strong-handed approach that protects vested interests. A precipitous drop in water supply will exacerbate Egypt’s internal challenges. A rapidly growing population, subsidised water costs, heavy water losses from inefficient infrastructure, wasteful irrigation, and highly damaging polluting practices all plague Egypt’s water sector. The country requires investment in more effective management tools within urban centres, alongside more productive agricultural practices in rural areas. More than 85 percent of Egypt’s freshwater withdrawal goes to agriculture, compared to the world average of around 65 percent. With its irrigation and drainage infrastructure operating at only 50 percent efficiency and 40 percent cost recovery, Egypt makes staggering losses. Equally pressing is the need to address the deteriorating quality of water. Only around 50 percent of Egypt’s population is connected to piped sewage systems that include waste water treatment. This drops to 12 percent in rural areas. Unsanitary disposal of domestic and industrial waste water lowers the quality of the water, a trend further aggravated by the shrinking volumes of water resources available. With support from the European External Action Service, Egypt completed a National Water Resources Plan to address some of these challenges. This document provides a 20-year roadmap (covering 2017-2037) that Egypt must pursue to reduce domestic consumption and mitigate the impact of water scarcity. Yet such efforts still face significant obstacles within Egypt, including inefficient public bodies that often act in conflict with one another. For example, while the Ministry of Water has in the past tried to reduce the amount of land used for water-intensive crops such as rice, the Ministry of Supply and Internal Trade offered incentives to farmers planting rice crops. Furthermore, public education campaigns have recently proliferated in Egypt stressing the need to preserve water and limit polluting practices, but on their own they are insufficient. These have only recently begun in earnest, with the prevalent belief among the population being one rooted in the myth of the riches and abundance of the Nile as an ever-giving source of water. As one expert noted, even though Egypt is 95 percent desert, it has never acted like a desert country. These factors underscore the urgency of significant changes inside Egypt to address mounting challenges. Given the high level of wasteful water losses and unbridled consumption, tackling subsidisation is of paramount importance, as it is elsewhere, and is a policy that the government can immediately begin pursuing. The Sisi regime has already taken measures to implement domestic reforms that international donors such as the International Monetary Fund have promoted in other parts of the world. The regime might be able to address the issue of water subsidies better than other governments, although this is likely to come through its authoritarian ability to quash protests and quell unrest. Activists have already reported greater policing around journalistic practices and advocacy involving the security of the Nile and other water issues. Such policies may be effective in the short term in pushing through cuts to water subsidies, but they do not point to a future in which Egypt has a more sustainable water sector. Egypt offers a clear example of a country that faces both transboundary and domestic threats to its stability as a result of water scarcity. In its foreign relations with Ethiopia, Egypt is well placed to take the lead in initiating a multilateral regional approach to water management that could benefit all the stakeholders. Securing supply from the Nile, however, does not mitigate the urgent need to address Egypt’s domestic water situation, which is moving along a path of unsustainable consumption. It is impossible to separate Iraq’s water security from the ongoing conflict and unrest in the country. Iraq faces an extreme situation when it comes to water, one that is exacerbated by domestic tensions, regional developments, and the weight of conflicts and sanctions that began following the first Gulf War in 1990. Prior to the conflict, Iraq’s water sector was one of the most advanced in the region, in terms of supply and distribution. Since then, however, the absence of investment in the water sector, as well as the general destruction wrought by conflict, have taken their toll. For example, irrigation canals and other major components of water infrastructure have deteriorated and at no point over the last two decades have any of Iraq’s dams been filled to capacity. Like Egypt, Iraq relies predominantly on transboundary sources of water supply. The Euphrates and the Tigris, Iraq’s main rivers, originate in Turkey and flow through Syria and Iraq to the Gulf. Political tensions between these neighbours, particularly since the beginning of the Arab uprisings, have ensured that these water bodies remain highly politicised. This year, worries about Iraq’s dependence on sources of water originating abroad peaked when water levels in Baghdad became dangerously low. Responsibility for this lies partly upstream, specifically with Turkey, which has embarked on a major irrigation and electrical power project called the Southeastern Anatolia Project. This massive undertaking involves the construction of the Ilisu Dam, one of several dams that will ultimately slow or reduce the flow of water into Iraq from the Euphrates and the Tigris. But river flows in Iraq have been dropping for years, due to climate change and persistently high levels of consumption upstream. This has dealt a significant blow to food production, electric power generation, sanitation and healthcare, and industry. Recently, erratic weather patterns, particularly drought in northern Iraq and unpredictable periods of rainfall, have had a major impact on Iraq’s freshwater supply. Industrial waste and pollution in Iraq, and further upstream in Syria and Turkey, have also undermined the quality of water available to Iraqis. International organisations such as the United Nations have long noted that the quality of water in Iraq for drinking or agriculture fails to meet the standards of the World Health Organization or even of Iraq’s own national standards. Iraq’s transboundary dilemma may resemble Egypt’s challenges, but the situation in Iraq is different primarily because of the weakness of the Iraqi state. This has both domestic and regional implications. Regionally, Iraq has a weaker negotiating position with its neighbours than Egypt does with Ethiopia and Sudan. Turkey has indicated that it will cooperate with Iraq to ensure that its projects do not threaten Iraq’s security. However, such cooperation has been fleeting, and remains secondary to Turkey’s pursuit of its own economic development and regional influence. The situation highlights the significant influence that Turkey will continue to have over Iraqi affairs. By holding power over Iraq’s water security, Turkey has the ability to shape domestic Iraqi politics, including in the areas of governance, Kurdish nationalism, and bilateral relations with other powers such as Saudi Arabia and Iran. Perhaps more threatening are the domestic implications of this weakness. The highly sectarian and decentralised Iraqi state, unlike Egypt’s military regime, has seen water become a subject of fierce political challenge. For example, Muqtada al-Sadr, the influential Iraqi Shia leader, publicly issued the Iraqi government with a deadline to address water scarcity. Such domestic political competition also means there is suboptimal coordination between public bodies within the government of Iraq and within the Kurdistan Regional Government due to their diverging interests, further undermining investment in water. Rather than blame other countries such as Turkey, the Iraqi public tends to hold the government accountable for the water situation, pointing to the lack of a coherent strategy to manage long-standing challenges. The conflict means infrastructure is heavily under-developed, if it has not been destroyed. Poor water distribution has pushed many Iraqis to fend for themselves by, for example, drilling wells outside state infrastructure. Iraq’s water tariffs continue to be among the lowest in the world, and inefficient use and wasteful consumption of water is widespread. Even now that the conflict has largely receded, the central government is still not ready to tackle the increasingly destabilising threat of water scarcity that has been gathering pace over the past two years. Its mission is complicated by the level of tumult in the country, where, as in Jordan, all cities host internally displaced persons, further straining the water infrastructure available for supply and distribution by reshaping population density in urban areas. Collectively, these factors constitute a significant potential source of destabilisation and tension within states in ways that do not manifest themselves merely as social protests at subsidy removals. Iraq demonstrates the challenges of pursuing development and growth within the context of ongoing conflict and instability, particularly given the post-ISIS reconstruction required in vast swathes of the country. While water has not been the cause of this conflict, the challenge of water scarcity threatens to aggravate relations between Iraq and its neighbours, and to create domestic tension, thereby further feeding this instability. Unless Iraq’s water sector undergoes reform to deal with the challenges of water scarcity, and receives investment for infrastructure development, its water challenges are likely to become principal drivers of unrest. The United Arab Emirates is one of the ten most arid countries in the world. There, as elsewhere in the MENA region, climate change is exacerbating already significant water scarcity. At the same time, the UAE has one of the highest per capita water consumption rates in the world. Nonetheless, the UAE’s Water Security Strategy 2036 is a clear plan for contending with its water scarcity and for enhancing the efficiency of its water management tools. The UAE is pursuing the strategy’s measures correctly and competently: these primarily include realigning tariffs with costs and enhancing the efficiency of water usage to reduce unsustainably high levels of consumption. The government has also sought to head off future instability deriving from problems with the water supply by using substantial public and private investments in non-conventional sources of water supply – namely, desalination plants. 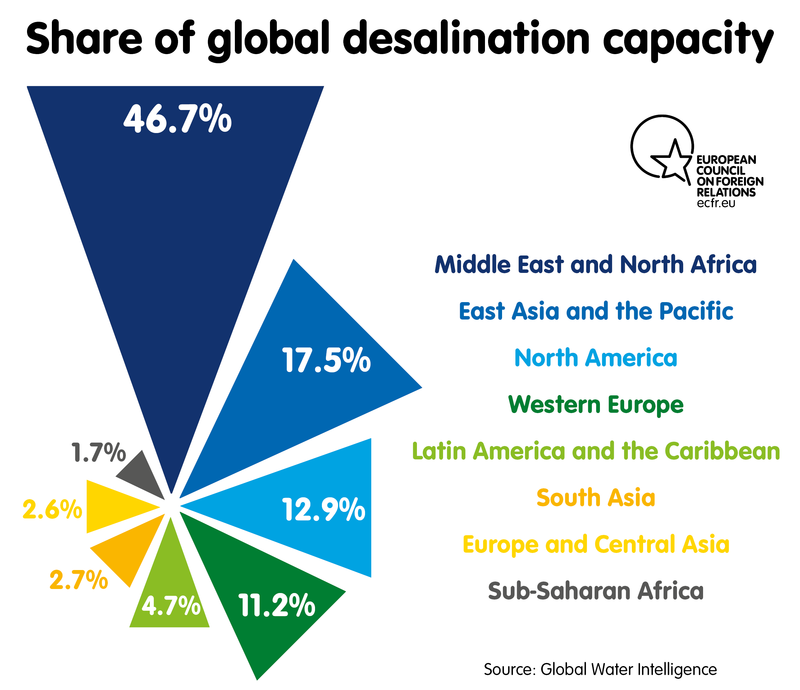 Collectively, the MENA region accounts for the largest share of desalination capacity worldwide as a result of investment in this sector, particularly that in the Arabian peninsula. The public wealth accrued as a result of oil and gas revenue has enabled Gulf states to pursue non-conventional water supply on a massive scale. But, while certainly advantageous in overcoming the destabilising impact of water scarcity, non-conventional water supply does not address longer-term challenges. The technologies that the UAE uses are highly capital- and energy-intensive, making water supply contingent on the government’s ability to continue underpinning such demanding investments. Past crises arising from drops in the oil price or other economic shocks have demonstrated the risk of such exposure, spurring efforts by the government to develop desalination technologies that are more energy-efficient, including solar-based desalination. By relying on innovation and technology in non-conventional sources of water supply, the UAE has mitigated the destabilising effects of its water scarcity. It has also addressed some of the potential for domestic instability relating to water challenges. Nevertheless, there are further sustainable measures for the longer term that it can put in place. The UAE still has to address the risk of relying so heavily on non-conventional sources of supply. Such risks include environmental concerns caused by desalination, in particular the impact that the desalination process and the high salinity discharge has on marine life, as well as the country’s ability to sustain high-cost water supply in the future. Morocco’s renewable water supply comes from a combination of surface water and underground basins that are fed primarily from the Atlas Mountains and that collectively form seven river basins. One of the most important of these, the Tensift Basin, is currently close to depletion. Droughts, unpredictable rainfall, and Morocco’s vastly diverse terrain have made it difficult to collect water in a way that provides a reliable supply to the public. As a result, Morocco has long used dams to capture water supplies and ensure effective distribution. This policy has resulted in the construction of 140 large dams across the country. The government estimates the current availability of freshwater in the country’s basins to be lower than levels of consumption in the country, making Morocco a water-scarce region. This is caused by many of the same trends that plague the region: population growth, urbanisation, water-intensive agriculture, and climate change. In an effort to enhance its water security, the country has invested in extending accessibility to rural populations, including through its expansive network of dams. However, despite such policies, rural accessibility remains low within the region. While the urban population has an accessibility ratio of 95.7 percent, for the rural population this figure stands at 63.7 percent – a significant gap. There are other distinct disparities between Morocco’s more urban coastal population and its rural dwellers. Economic development in Morocco – and across the Maghreb – is driven by industries that are water-intensive, including agriculture, mining, hydrocarbon extraction, and tourism. Elites often own and run these sectors, and this section of the population is well positioned to benefit from them even as they exacerbate the country’s water challenges, heighten inequality, and increase resentment among the population at large. For example, one of the primary causes of scarcity in rural areas is water-intensive agriculture – such as watermelon farming – which has worsened the effect of the drought on citizens. Morocco therefore faces a situation in which improvements in urban areas have not been matched in rural localities. Climate change has been particularly damaging in Morocco, as major droughts over the past few years have exacerbated shortages away from the coast. As a result of that stress, over the last two years taps ran dry for days on end in some villages, triggering protests. In 2017, these protests saw Moroccans demand that the government address the issue of water shortages. The demonstrations raised worries among North African governments that a new wave of uprisings might sweep across the region. Although they were somewhat sparse, the demonstrations signalled that access to water had become a cause of social unrest. Water is today often cited among the top five demands by protestors in the country. The Moroccan government’s inability to address the challenge of water scarcity in an integrated manner has contributed to the distrust people feel and increased their suspicions that corrupt practices take place in the sector. This weakens the social contract between government and citizens. One expert believes that the protests were prompted by a particularly extended dry period and do not reflect the development initiatives underpinning Morocco’s water infrastructure. Environmental stress is likely to exacerbate destabilising underlying socioeconomic tensions – a threat that the government is aware of. According to Charafat Afailal, the government’s secretary in charge of water: “The issue of water has always been a priority for Morocco, but today, after two years of drought, we have to move on to higher gear.” The authorities have to contend with the fact that various sectors within Morocco are engaged in unsustainable water use. Although this problem is not new, the government now has to rely on emergency measures to mitigate the potential for water to cause instability. Domestic social unrest: Water scarcity becomes a catalyst for citizens to express their growing frustration with ruling elites. Rulers’ failure to provide a reliable supply of high-quality water leads citizens to perceive them as unable or unwilling to provide the populace with a good quality of life. Environmental stress: States are unable to deal with either unexpected weather patterns or longer-term environmental stress. Although water scarcity has mainly acted as a multiplier of tensions thus far, in countries experiencing extreme environmental stress, a lack of water has the potential to become a primary cause of conflict, migration, and state collapse. Transboundary conflict: States’ pursuit of water security pushes them into confrontations or stand-offs with neighbours they share water resources with. Transboundary migration: The influx of migrants and refugees due to displacement and conflict elsewhere in the region puts pressure on water supply and provision domestically. In light of this, it is clear that many MENA countries need to change their approach to water management in order to ensure that their supply and consumption of water in their water-scarce region is sustainable. If they do not, they risk denying their populations access to sufficient quantities of clean water. They also risk exacerbating inequalities and tensions in their societies. On the supply side, countries should pursue measures that meet basic demand and ensure sustainability in the longer term. In order to achieve resilience, and to minimise the shock of exposure to water shortages, national water strategies need to account for climate change and erratic weather patterns. Many countries are already addressing the supply-side question in some form. On the demand side, however, the urgency is greater. Governments need to take steps to recalibrate consumption in order to reflect the true value of water. This is vital given the increase in consumption that will accompany population growth. These approaches are prerequisites for regional stability. As the case studies above suggest, measures to address challenges around water supply and demand need to take account of a wide range of factors. Countries have to embrace an integrated approach that positions the issue of water scarcity alongside other political, socioeconomic, and environmental concerns. The EU and its member states can provide assistance in a number of ways. Reforms will, of course, vary from country to country. Nonetheless, there are several paths forward. If current trends persist, cross-border water disputes are likely to become more common. If the MENA region continues along this trajectory, shared water bodies will become the focus of new tensions, as has already happened in Egypt and Iraq. The case studies demonstrate that a number of factors will determine how such tensions unfold, including wider political conditions and the balance of power between states. Water diplomacy is likely to become increasingly important, as are the institutions that facilitate regional cooperation, such as regional investment funds. The EU and its member states have recognised the potential of using water diplomacy in their regional policies, and they already provide technical and financial support to facilitate cross-border cooperation, as in the case of cooperation between Jordan and Israel. But they can do more. For instance, the EU can: facilitate and moderate negotiations between regional states; support the growth of regional institutions through expertise and funds; and act as a third party that can oversee the implementation of regional treaties. The EU can also balance the negotiating field between regional actors in instances of significant asymmetry, such as that between Israel and the Palestinians and that between Iraq and Turkey. This is particularly true since the EU is an active stakeholder in some of these transboundary projects, such as the Red-Dead Canal project which receives support from the EU’s Neighbourhood Investment Platform. Water diplomacy on the part of the European states need not limit itself to facilitating negotiations between regional actors. It can also proceed through bilateral negotiations between the EU and specific countries within the region. As the case studies indicate, a significant challenge that countries in the region face is the misalignment between their economic make-up and their water supply. Countries such as Morocco rely on water-intensive sectors, including in agriculture. This configuration has destabilising potential, as water becomes a focus and a cause of socioeconomic grievances. The EU can support countries in the region, particularly those in North Africa, to develop sectors that are more aligned with their water needs. Through trade negotiations and other partnerships, the EU has the purchasing power to encourage countries to move towards more water-efficient economies, by varying the crop types they grow, for example. More equitable trade policies between the EU and North African countries would provide benefits that extend beyond water scarcity and enhance bilateral relations more broadly. It is important that regional players ensure that the prices people pay for their water allow for cost recovery. This is not only vital to reducing unsustainable consumption, it also allows governments to redirect public expenditure towards more effective investments, such as less wasteful water distribution infrastructure. Given the destabilising potential of subsidy reform, governments will need to approach this in as transparent a manner as possible, particularly against the backdrop of low public confidence in governments across the region. Iran has already demonstrated success on this front. The government rolled out campaigns that focused on public education, adopted active communication measures to explain the urgency of such steps, and targeted subsidy removal on the wealthy rather than on the poor. Governments elsewhere in the region should apply these important measures. Otherwise, the perception – and, often, the reality – is that government policies indirectly benefit the wealthy. The EU can play an active role in supporting governments to devise and implement such strategies. The EU’s engagement with Egypt’s water sector is a good case study of the kind of support that it can generate, demonstrating how the EEAS contributed to formulating the Egyptian national strategy, from preparation through to the early stages of its implementation. Apart from Israel and the oil-rich Gulf states, countries in the MENA region need to lobby for development funds to enhance the efficiency of their water infrastructure. The EU’s development funds can play a critical role in underpinning the water sector in these countries. They already do in some areas, as seen in EU-funded projects for water management in Jordan, such as the West Irbid Wastewater Network, which the EU supports through its Regional Trust Fund in Response to the Syrian Crisis. However, beyond European financial support, governments in the region should pursue strategies that tap into the power of their private sectors to support this kind of infrastructure development. Public-private partnerships can play a key role in this area, whether this is for technical expertise, such as the Arab Countries Utility Association, or for funds. The EU can also use its bilateral relations with MENA governments as leverage to encourage such development in these countries. Water scarcity throughout the MENA region has led to multifaceted and interrelated problems that national governments have only had very partial success in dealing with. Worryingly, water scarcity and water insecurity have the potential to exacerbate these problems and to increase instability. Of course, from a European perspective, instability in the MENA region rarely remains confined there. As a result, European governments, the EU, and MENA countries should all now work to get ahead of this problem by agreeing and implementing thoughtful and effective policies to mitigate the detrimental impact of water scarcity. Understanding the dynamics within each country will be crucial, as will devising solutions that help governments stabilise their water resource management and thereby avert instability in the societies they seek to govern. The author would like to thank Julien Barnes-Dacey, Chloe Teevan, and the rest of the European Council on Foreign Relations Middle East and North Africa programme for their support in this project. Special gratitude goes to Adam Harrison for his excellent and careful editing, and to Chris Raggett for the graphics. The author would also like to thank Peter Schwartzstein for his guidance in reviewing earlier drafts of this paper, as well as the interviewees for their time and expertise. The author takes responsibility for any mistakes in the paper’s content. Tareq Baconi is a visiting policy fellow with ECFR’s Middle East and North Africa programme where he focuses on the politics of natural resources in the MENA region. Baconi has worked as a consultant in the energy sector, most recently as a managing consultant in Navigant’s energy practice in London. Alongside his advisory work, he has pursued research projects relating to the contemporary geopolitics of the region, particularly Israel-Palestine and Islamic movements. His book, “Hamas Contained: The Rise and Pacification of Palestinian Resistance” was published by Stanford University Press in 2018. “Beyond Scarcity: Water Security in the Middle East and North Africa”, World Bank Group, 2018, p.xxv, (hereafter, “Beyond Scarcity: Water Security in the Middle East and North Africa”). “Beyond Scarcity: Water Security in the Middle East and North Africa”, p.1. “Beyond Scarcity: Water Security in the Middle East and North Africa”, p.26. “Beyond Scarcity: Water Security in the Middle East and North Africa”. Haim Malka, “Water Pressure: Water, Protest and State Legitimacy in the Maghreb”, Center for Strategic and International Studies, June 2018, (hereafter, “Water Pressure: Water, Protest and State Legitimacy in the Maghreb”). Eckart Woertz, “Agriculture and Development in the Wake of the Arab Spring”, International Development Policy, July 2017. “The Cost of Irrigation Water in the Jordan Valley”, World Bank, 2016; “Development Cooperation in the Water Sector”, Embassy of the Federal Republic of Germany in Amman, 2017. Telephone interview, EEAS official, 30 August 2018. 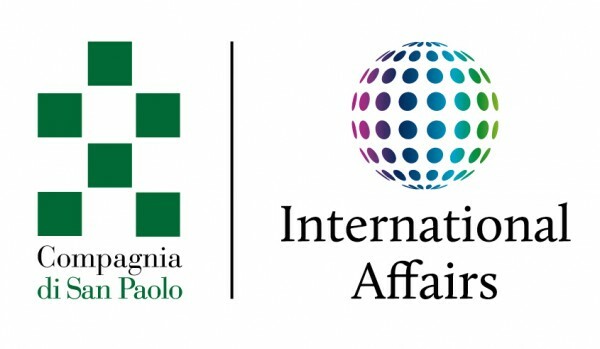 Telephone interview with EEAS official, 30 August 2018. 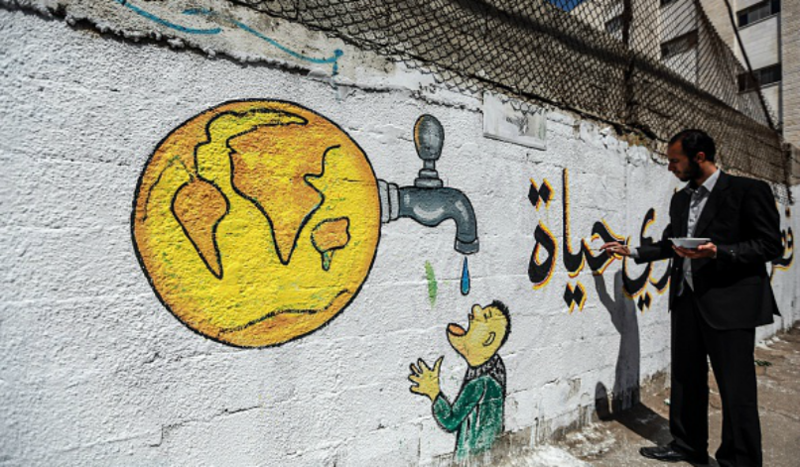 “Troubled Waters-Palestinians Demand Fair Access to Water”, Amnesty International, 2009; and “Assessment of Restrictions on Palestinian Water Sector Development”, World Bank, 2009. Telephone interview with EEAS official, 30 August 2018; “National Water Strategy 2016-2025”, Ministry of Water and Irrigation. Telephone interview with Middle East-based water expert, 31 August 2018. “Beyond Scarcity: Water Security in the Middle East and North Africa”, country profiles in appendix. Peter Schwartzstein, “Battling pollution in history’s most fabled sea”, UN Environment, 14 June 2018. “Beyond Scarcity: Water Security in the Middle East and North Africa,” p.xxxiv. “Water Pressure: Water, Protest and State Legitimacy in the Maghreb”. Telephone interview with Morocco water expert, 4 September 2018.